Pictured above: A 3D photogrammetric reconstruction of a large deep-sea coral rock. Sharing the beauty and mystery of the deep ocean has always been a challenge. But as technology improves, so, too do the ways the public can learn about the amazing discoveries that result from investments in ocean exploration. Virtual reality (VR) is a potentially powerful new tool for environmental learning, and a team of MBARI scientists and engineers are testing its application in the deep. When someone puts on a VR headset, they can be instantly immersed in a three-dimensional panoramic experience. This immersive experience has led the MBARI researchers to work to adapt VR not only for use as a tool to engage and teach the general public, but also as an aid for immersing the researchers themselves in their environment of study. In the longer term, 3D information will be integrated as a layer of “augmented reality,” allowing scientists to measure and quantify organisms to an extent not possible with current technologies. For example, a scientist could calculate the biomass of any squid that swims past, or determine the distance to its nearest prey item as if they were literally standing beside the animals. 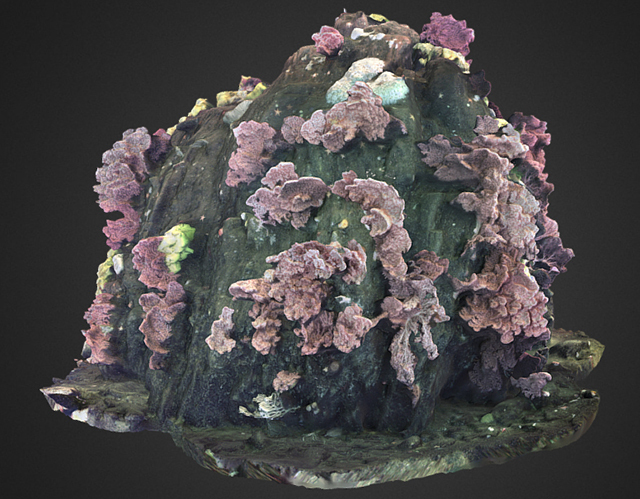 A 3D photogrammetric reconstruction of a large deep-sea coral rock being studied at MBARI. This image was reconstructed using approximately 7,000 still images captured from ROV *Doc Ricketts*. Image by Ben Erwin. In 2019, MBARI’s VR team will work with leading industry developers and educators to design and build a deep-water VR camera system. This camera will be installed onto MBARI’s remotely operated vehicle Doc Ricketts to facilitate the capture of high-quality panoramic video. When viewed through a virtual-reality headset, the viewer will partake in a 3D experience that will feel like actually riding along on the ROV—but without the dangers of the deep ocean. The resulting content will be distributed on social media sites and through other channels to make it available to a broad audience. To accomplish that goal, the team will work closely with MBARI’s Information and Technology Dissemination Division and the Monterey Bay Aquarium as well as educational programs at Stanford University, and documentary filmmakers working with National Geographic and Google. Stay tuned for a unique VR experience coming soon! A conceptual representation of a VR camera installed on the ROV Doc Ricketts. Project tests the ability of an autonomous sailboat to stay on course in rough conditions to enable carbon studies in remote regions.